SCVHistory.com LW3272 | Magic Mountain | Revolution Roller Coaster, Publicity Photo, Early 1990s. 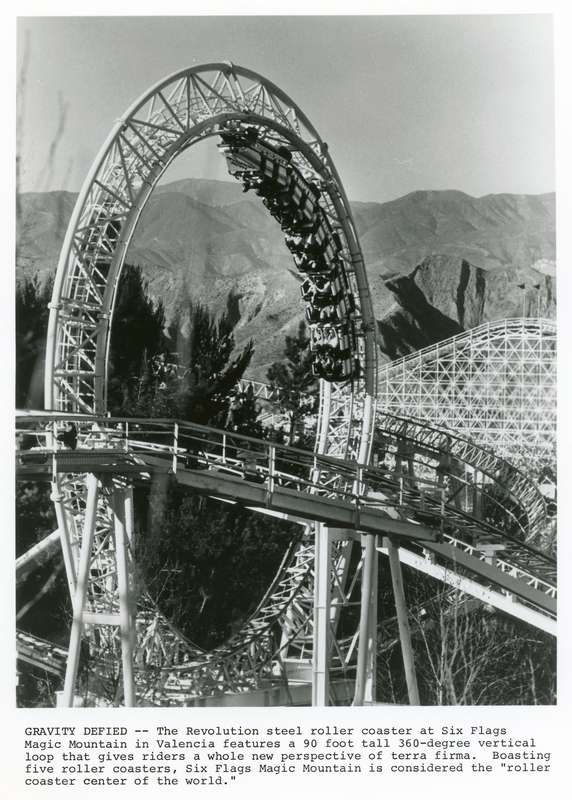 The first vertical-looping roller coaster of the modern era — at least the first since Coney Island, N.Y., in the early 1900s — opened May 8, 1976, at The Newhall Land and Farming Co.'s Magic Mountain amusement park in Valencia. Created by a pair of German engineers — Werner Stengel (design) and Anton Schwarzkopf (fabrication) — at an estimated cost of $3 million, the coaster was named the Great American Revolution in honor of the 1976 U.S. bicentennial. At first, ride operators' uniforms mimicked Continental Army uniforms. The new ride was credited with a 46-percent increase in park attendance during June 1976 compared to June 1975 (The Signal, July 7, 1976). Even people who never visited the park got a feel for the ride in movie theaters, courtesy of the 1977 thriller from Universal Pictures, "Rollercoaster," starring George Segal and Richard Widmark. It was one of the first films shown in Sensurround. After Six Flags purchased the park in 1979 the ride was renamed "La Revolución" in honor of the Mexican revolution of the 1910s. In 1988 the name was changed to "Revolution." GRAVITY DEFIED — The Revolution steel roller coaster at Six Flags Magic Mountain in Valencia features a 90-foot-tall, 360-degree vertical loop that gives riders a whole new perspective of terra firma. Boasting five roller coasters, Six Flags Magic Mountain is considered the "roller coaster center of the world." Who knew five coasters would seem quaint? Twenty-five years later it had 19. LW3272: 9600 dpi jpeg from original photograph purchased 2018 by Leon Worden.